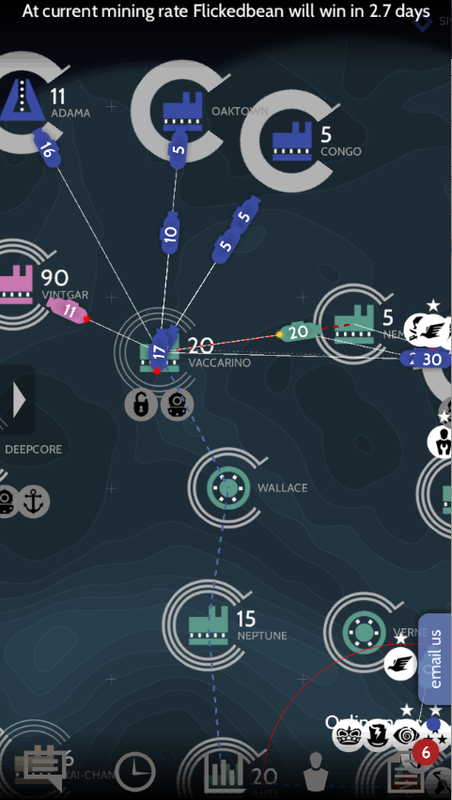 I picked up subterfuge on iOS (for free) after reading some interesting reactions. It's a game of real time decisions, base capturing, alliances, backstabbing, and underwater mining. At least that's what it is supposed to be. What I've actually found is a game where no one talks, no alliances are formed, people make some moves in the game then get sick of waiting for the real time aspect to happen so they resign. Subterfuge is a game that's supposed to take place in real time over the course of about a week. What this means in reality is that you can set some orders to move your drillers around to new bases and then wait for most of a day before making any other meaningful decision. I think the game would be more fun if it were just faster. The few games I played I won just because everyone else got bored and resigned. They walked away from the games mid-progress and I don't really blame them. There's not enough here to keep a person engaged. Now, that might be different if you're playing this with a big group of friends who know each other. I bet that in that case alliances would form, secret conversations would take place, and some fun backstabbing could happen. But, in random games I couldn't get a single person to talk or interact. I'm recommending you stay away from this one, unless you have a big group of friends who are all willing to play at the same time. Check out the trailer below to see exactly what doesn't happen when you play this game with random people.